Most of us see anxiety as a bad thing, so at the first sign of it we try to fight back or run away. But according to Robert Rosen, this outdated view ignores one of the most powerful forces in business: Anxiety helps us concentrate, learn, relate to people, think more creatively, and deliver better results. Of course, too much anxiety causes fear, chaos, and loss of morale. But too little leads to stagnation and a false sense of security. It’s like a rubber band: If you pull it too hard, it breaks. If you don’t pull it hard enough, you fail to maximize its potential. Finding the happy medium between panic and passivity is the secret to success. 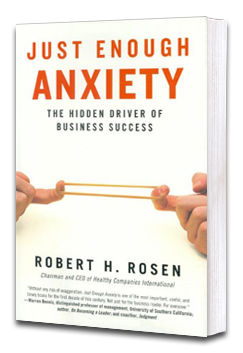 Drawing on twenty years of research with CEOs, Rosen explains how great leaders succeed by living and leading with just enough anxiety. He shows how the ability to manage anxiety brings out their own best performance, enables them to build great teams, and inspires and challenges their organizations. Only when we allow ourselves to feel our insecurity, discomfort, confusion, and pain can we reach our potential, both as individuals and teams. Just Enough Anxiety offers practical guidance to all kinds of organizations, blending cutting-edge psychology with real-world stories of success.